A lovely little surprise at my Birth Afterthoughts meeting when the midwife said I could look through my hospital notes if I wanted. And there it was, my baby’s name, my beautiful, strong and shiny one always reminding me of how much love, hope, joy and peace we are lavished with in the midst of the darkest of horrors. The best is yet to come. Only Jesus. King of Kings and Lord of Lords, HE turned my mourning into dancing. No one cradles us in our anguish like he does. The ongoing care and attention to the smallest ripple of anxiety to the excruciating heaviness of heart, in my weakness his strength never fails to gently thunder in. I’ve been told that I had a lot going on at the time and I was doing too much and not resting. And that maybe it just wasn’t the right time for this baby. And the suggestion that it may have been a good thing as I wouldn’t have been able to do some of the things I’d done since. There have been lots of taking deep breathes along side well meaning words. Truth is how ever much we desperately try to scramble for the right thing to say, there are no positives to death. Whatever age or time. A lady on the bus had come up with the first opener and I told her about our baby, she asked when in the pregnancy and showed her relief when I said it was early on. The lady doing my hair came up with the second opener. I told her about our baby. “Still, not as bad as my sister” she said and told me that she had three babies die late in pregnancy. A sweet family friend in her eighties who was so distraught after her little one died she could never bring herself to go through being pregnant again. “Any more?” one of the home ed mums asked me and this led on to the loveliest conversation as we both shared our experiences of our babies that didn’t make it. The first time I saw death up close was through a window from the car where I’d been told to stay as it had been decided I was too young to go to a funeral. I watched as the miniature white and brass coffin was carried past. So many more experiences and conversations that are not for me to share. I started to panic because I couldn’t pop these rising bubbles. I didn’t want to upset her but I didn’t know if I could hold my back my emotions. Then just like that my Prince of Peace rescued me, peace swept over me and draped a warm blanket of stillness around me. I looked up at her and I saw brighter than day how Jesus sees her. Loved. Treasured. Died for. So desperately longed for. Truth scattered the lies like cockroaches in torch light as I was reminded we are all in this mess together; broken people living in a broken world. I hadn’t made the same choices as her but I was so so so far from perfect in how I’d lived my life. I saw we were both dealing with the heavy consequences of death and I listened as she opened up about the grief she was going through. We had the same pain, our babies have left huge holes in our families. I birthed my tiniest baby on Christmas Day, two days after I was told there was no heartbeat. The dark valleys of grief and the trauma of the physical process have not left me and neither has the incredible hope, peace, comfort, joy and love that was poured out to me and that is all because of one little baby given to us all. A love like no other that at our most destitute facing the punishment of death we rightly deserve, one we can never escape or work to pay ourselves. He took our place and paid the price on the cross. He took our sin, dealt with death by rising again to give us the free gift of eternal life. The greatest gift we could ever receive from a Father who never gives up on us no matter how far we run and how long we hide. He made the way, the ONLY way that we can return to Him. We have only two choices when it comes to being presented with gifts; reject or receive. At the end of last year we began making some big changes so we could have a better balance in some aspects of our lives. During this time we had huge devastation hit our hearts. So much changed overnight and so much was changing along side this. It’s been seven and a half months since we left our old home and we still haven’t decided on a location that will work best that we can call home. This season of my life has felt like I have been stuck swimming against a rip tide. I can still see the shore but fighting against the current of many continuing hardships and getting pulled further out to sea. I’ve felt tired, drained and worst of all spiritually exhausted. “Don’t be afraid to step into the fire”. I came away at full peace, knowing the future would be hard but it would be just great and that God had the details covered. I moved around many times in my childhood and adolescence, my parents worked overseas for long periods so school holidays were spent making sure I got to where I needed to be. I was 13 or 14 when I travelled from Leeds to London and checked into a hotel by myself, setting my portable alarm clock to make an early flight to Lagos. If staying in the U.K. I was either getting picked up, dropped off and journeying around the country to stay with relatives or family friends. I really relate to Paddington Bear because I always seemed to be lugging a suitcase around. This type of living provided me with great emotional and physical independence but also a huge craving for a secure base. Fast forward twenty five years and I here I was feeling the same well into my adulthood. I didn’t want to step into the fire, I wanted to stay in my comfort zone at the perimeter, toasting marshmallows and enjoying the warmth of the glow. Anything but in the fire! But one thing I know is that God doesn’t keep us in our safe spaces, what he does do is keep us safe in the unsafe spaces. We made plans, plans fell through, circumstances changed and we hit stumbling blocks. I became more frustrated and more focused on making sure our children continued to have access to fresh air and countryside rather than packed tube trains and the rush of city life. All my creative materials and equipment are still in storage and with limited space to design and make this contributed to more frustration. Also without our old community we were having to and still having to forge a new one. I made myself busy being busy but I knew my worries were all of the world. Like Martha I was distracted by everything that had to be done. I was being carried off by my fleshly desires and I was not at peace. Still struggling against the tide, my moods accurately reflected my constantly changing and uncertain conditions; up and down. Then there came the day where clarity hit me like a ton of bricks. We were at a museum for the day and as we were leaving the family rooms into the main foyer one of my children refused to budge and was crying loudly. A staff member made a gesture to me that I should try and keep her quiet and I just snapped. I thought ‘wow in six years of numerous tantrums, I finally found the lady who can quieten a child mid one’. I was so cross and stormed over and let her know what she was asking of me was ridiculous. Turns out that a child *can* be quietened mid tantrum when they see their mother have a tantrum too! That evening I went over what had happened and truth smacked me right in the face; I was not at peace. Here I was with all of God’s riches there for the receiving but I’d been led by my flesh. I felt just as the prodigal son when he realises his situation after eyeing up the food for the pigs (Luke 15:11-32). My planned letter of complaint turned into an apology letter which was passed on and received by the lady. Even at the times I’ve judged myself too far gone and beyond help or hope I’m continuously reminded we can come boldly into his presence because we have been clothed in His righteousness. This can not be changed, it can never be taken away. It is eternal. The greatest gift! Where was my home? Was my home dependent on my physical comfort, worldly possessions, security of a house and the continued presence of loved ones around? What happens when some or all of these are stripped away. Where was my Home? One simple prayer I found myself saying during these months was simply “Lord, bring me back”. It is never by our power to change or do the work but by His to change and do the work in us. I love love love the lessons the Lord teaches us in our hardships, how he draws us nearer to him. How every difficult circumstance is an opportunity to learn moment by moment and not rush through in frantic search of an escape. In the midst of this blazing fire he has shown me Home. He is home. We can’t even rely on our own bodies to keep us, as time passes they get older heading straight to inescapable death and decay but what joy that our spirits, forever been made alive in Christ, are continuously renewed day by day. 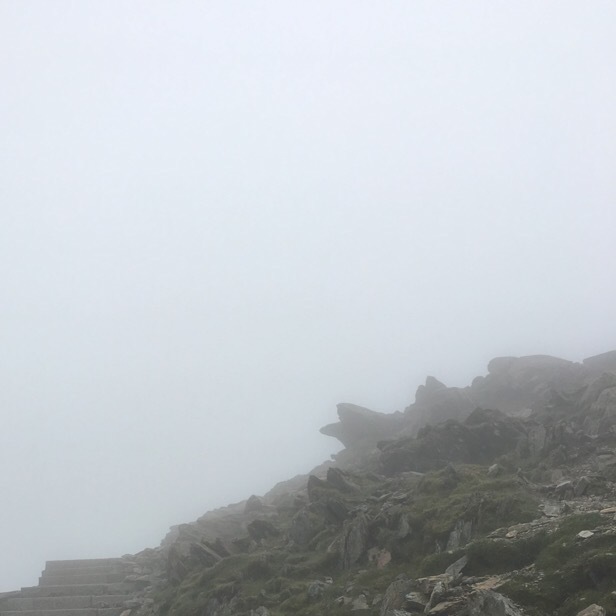 Earlier this year we took the steam train up Mount Snowdon, the weather was fine and we were excited for the breathtaking views ahead. As the train chugged along past jagged slate and startling a few of the hardiest looking sheep I’ve ever seen along the way, we entered the clouds. We stepped off the carriage and could barely see our hands in front of our faces. This wasn’t what I had expected! After a cup of tea and a sausage roll the clouds still hadn’t miraculously moved and it was time for our return journey. 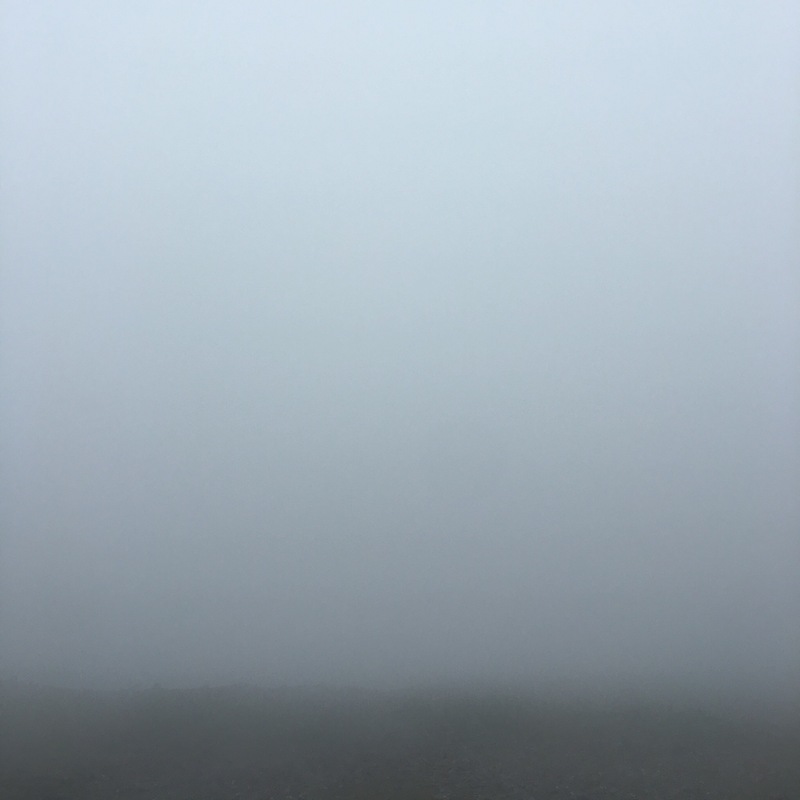 Strangely I left the summit as satisfied as if I had seen the view because while I stood at the top of that mountain staring into the fog, I saw so clearly how God’s word still stands, what ever situation we find ourselves in; fog or fire. The magnificent view was still there, beautiful, breathtaking and unchanging. I’ve been as stubborn as a mollusc stuck to her rock and my stubbornness has been overcome by His patience. My grumbling softened by his grace. My worries smashed by the fact he is a good Father, all his plans are good and for good even when things don’t go how we think they should. As sure as the rivers meander to the oceans, all we go through; pain, troubles and hardships all lead to a place that is good, there is no other outcome than one that is good. It is the sweetest assurance. My heartbreak in a box, on the wrong side of my womb. The depth of the pain is like none I have ever experienced but the joy of our Father’s love; soothing, unfailing tenderness in the most devastating of circumstances is what my heart can’t help but continuously sing about. The care, the comfort, the sweetest of visions, the attention to detail and love that I simply don’t deserve, who am I, little old me that our Mighty God could care so much! And *this* is how he cares for EVERY individual. Our tiniest’s remains were released after two months in the mortuary. We declined testing but the hospital tested anyway, then apologised. We chose a private cremation instead of a communal one. We didn’t use an undertaker and took our baby’s remains from mortuary to crematorium ourselves. I’d been shown ashes caskets that were hundreds of pounds, instead we bought a simple little jar. The mortuary provided a woven casket and one of my happiest memories is our daughters running around in the sunshine decorating it with daisies. That morning I’d been thinking about how “man shall not live on bread alone but on every word that comes from the mouth of God”(Matt 4:4) and how this whole experience had me fixing my eyes on the unseen, how in my physical bloodied distress my soul cried out, my spirit flooded in love and my hand lifted deep in worship. The power of our Lord had me singing in an A&E ward! Only Jesus! He does turn our wailing to dancing! My daily bread. The bread of life. Jesus. “But here is the bread that comes down from heaven, which anyone may eat and not die. I am the living bread that came down from heaven. Whoever eats this bread will live forever. This bread is my flesh, which I will give for the life of the world.” John 6:50-51. A good friend of mine called over the weekend and we spoke for hours. He wasn’t having the best of times. It broke my heart at how thirsty he was so I told him all about how much Jesus loves him. He couldn’t get his head around this type of love. “Well what if I am [like this] or I do [this] or [that]?” He asked. “It doesn’t make a blind bit of difference to how much you are loved, how much you are worth and how much you are valued” I answered. That night he went out to a party and called me the next day to tell me about it. It sounded a lot like one of the free parties we used to go to together. He said there were lots of travellers there and during the night a man came up to him and told him “Jesus loves you”. I wasn’t in the least bit surprised but he couldn’t believe it because only I had ever told him about Jesus, all through his upbringing he’d been told to stay away from “all that”. And on the same day I had told him how much Jesus loves him, a stranger had appeared at a party, in the middle of the night, amongst all the drink and drugs and told him “Jesus loves you”. I thought it couldn’t get more amazing to have the revelation of God’s love in my life but to see how it unfolds in the lives of others is something pretty phenomenal. People think that finding God is about finding religion, doing to please, trying, working and searching. Truth is God is pursuing us with such ferocious unrelenting love and meeting us in the places where we least expect. Longing for us to go from turning away from him to turning to him. A couple of months ago I found myself spiritually lacking, the fire had gone, the comfort had gone, the overflow of joy was no where to be found. I felt lost. I felt like God had abandoned me. I blamed him for the tough journey I was facing. Why couldn’t life be straightforward, I succumbed to the fact that the pattern of my life had never been straightforward so what did I expect now. I was down on every aspect of my life. I whinged to God about it all and even complained that me and my family don’t go to church and I felt left out. But even in my angry rants and my sorry self pitying painful state, I couldn’t shake off the hope, the light, the certainty and the excitement that the turnaround was near. I waited on his word. It is such a good and impossible-to-comprehend feeling to have everything come crashing down around and to feel so weak but to have a well of hope bursting from the centre of your being, to sing praises in the pain because God is good, his plans are always good, every rocky path leads to a place that is good. I took the children to a free community event, after crafts and play we sat in a tea room tent. A group of belly dancers were performing and I was shrinking into my seat hoping I wouldn’t get called up to participate. After the audience participation was over, a man was introduced and began to tell his story. He articulated everything I had been feeling and his words sank so deep into my soul that tears uncontrollably started running down my cheeks. I felt embarrassed I was crying in a room of strangers and wanted to leave but no sooner than he’d put the microphone down I stood up, approached him and told him his words had really spoken to me. He spoke such words of sweetness and encouragement to me, “yes of course you can pray for me” I answered and he very simply prayed peace over me. He gave me a big hug and reminded me to always speak truth over myself. The next day I had a renewed strength. When we are in the wilderness we become acutely aware of our spiritual need, nothing and no one can satisfy but God and through the trials our faith is strengthened. We long for deeper and cling on harder and grow stronger to stand firmer than ever before. I love Psalm 63:1 David writes “my soul thirsts for you; my flesh faints for you”. Jesus is always pulling us closer, he is “the pioneer and perfecter of faith” (Hebrews 12:2) It’s so easy to get comfortable where we are, but He never leaves us stagnant, he lovingly disciplines us, guiding us in the right direction. He continually draws us in more so we get to know him more intimately, positioning us perfectly so we can see the unraveling of everything he has already laid out before us, leading us further into spiritual maturity. The weekend before last as I walked along a pier I got talking to a woman and as I was about to leave she pulled me back and prayed for me, she prayed with such power and authority about deep things that I hadn’t told her or anyone. As I walked back to the shore I couldn’t help smiling because that is the Church; in tea rooms, on piers, all over the place. The body of Christ, one in spirit. He in us.